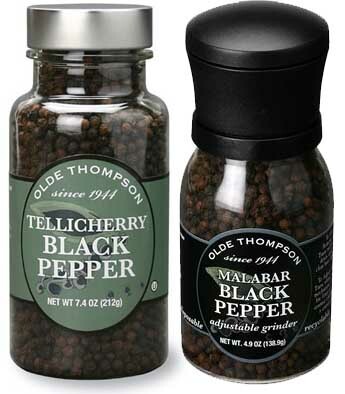 Grocery stores in Canada carry Malabar and Tellichery black pepper. Malabar, one can easily associate with pepper, but how come a small town Tellichery in Kerala, India, has been associated with this spice. Tellichery is the name given by the British to Thalassery. The name originates from the Malayalam word ‘Thala’ (Head) and ‘Kacheri’ (Office), thus Thalassery or ‘head of offices’. The Europeans nicknamed the town ‘The Paris of Kerala’, as it was in close proximity to the sole French military base in Kerala in that era. Later the French abandoned Thalassery and shifted their base to Mahé. Thalassery had a unique geographical advantage as a trading center being the nearest point from the coast to the spice growing area of Wayanad. The trading center developed mainly after the 16th century when the British got permission to set up a factory in Thalassery from the local ruler. Various conflicts with the local chieftains prompted the British to build a fort in Thalassery. The local king gave the fort and adjoining land to the British in 1708. The fort was later modified and extended by the British East India Company. The king also gave permission to the British to trade pepper in Thalassery without paying duty. After the construction of the fort, Thalassery grew into a prominent trade center and a port in British Malabar. The British won absolute administrative authority over Malabar region after annexation of the entire Malabar region from Tipu Sultan in the Battle of Sree Rangapatnam. Thalassery thus became the capital of British North Malabar. In 1797 The British East India Company established a spice plantation in Anjarakandy near Thalassery. In 1799 it was handed over to Lord Murdoch Brown with a 99-year lease. Coffee, cinnamon, pepper and nutmeg were cultivated there. The Anjarakandy cinnamon plantation was the world’s largest at that time. The construction of the Tellicherry Lighthouse in 1835 evidences the importance the British attached to the area. The British East India Company built a new spice warehouse in 1863 and also established the first registrar office in South India at Anjarakandy in 1865, only to register the cinnamon plantation of Murdoch Brown. Thalassery municipality was formed on 1 November 1866 according to the Madras Act of 1865 of the British Indian Empire, making it the second oldest municipality in the state. At that time the municipality was known as Thalassery Commission. The Arab traders had monopolised the pepper trade from the Malabar region from about 1500 BC. They sailed in boats through the Arabian Sea, hugging the coastline and reached Malabar and Travancore regions. From there they used the backwaters and the rivers to move inland. The Arabs sold the pepper procured from these regions in Egypt and Europe. Black peppercorns were found stuffed in the nostrils of Ramesses II, placed there as part of the mummification rituals shortly after his death in 1213 BC. In order to dissuade the Europeans from sailing into the Malabar coast, the Arabs successfully spun many a stories and myths about black pepper. The most common story was that large many-headed serpents guarded the forests where pepper grew and the local people would set the forest on fire once the pepper ripened. The fire would drive away the serpents and people would gather the peppercorns before the serpents could return. The black colour of the pepper was due to burning. Trade interactions between the Arabs and the locals from Malabar resulted in many marital alliances. Some Arab traders settled in the Malabar region and Islam flourished there as a result. Today the region is dominated by Muslims. In Kottayam, south of Malabar, the spice trade was based on the backwaters and rivers with Thazhathangady (Lower Market) and Puthenangady (New Market) as trading posts established by the Arab traders. Wherever the Arabs established trading posts, Islam also flourished there. The Christians in the region believe that they were converted by St Thomas, one of Christ’s disciples in the first century, who might have travelled in one such ship. Many Christians and Jews persecuted in Persia fled to Kerala in the Arab ships and settled along the coast. Fort Kochi area was known for its Jewish settlement and these Jews were called Malabar Jews and are the oldest group of Jews in India and settled there by the 12th century. They built synagogues in the 12th century and are known to have developed Judeo-Malayalam, a dialect of Malayalam language. Peppercorns were a much-prized trade good, often referred to as “black gold” in Europe and used as a form of commodity money. The legacy of this trade remains in some Western legal systems which recognize the term “peppercorn rent” as a form of a token payment made for something that is in fact being given. Pepper was so valuable that it was often used as collateral or even currency. In the Dutch language, “pepper expensive” is an expression for something very expensive. Its exorbitant price during the Middle Ageswas one of the inducements which led the Portuguese to seek a sea route to India. In 1498, Vasco da Gama became the first person to sail to India by circumventing Africa. Gama returned in greater numbers soon after and Portuguese by the 1494 Treaty of Tordesillas gained exclusive rights to trade in black pepper in Malabar. Pepper’s popularity quickly spread through world cuisines once more trade routes were established. At one time it accounted for a whopping 70 percent of the international spice trade. As it became more readily available, the prices dropped, and ordinary people were able to enjoy it. Regional cuisines began incorporating pepper into their foods alongside native spices and herbs. Whatever may be the history of black pepper. it is still sold as Malabar or Tellichery pepper even though currently Vietnam is the world’s largest producer and exporter of pepper, producing 34% of the world’s requirements. An interesting read, with historical details. Reji, but why the two different names? The title pointed towards a possibility of different quality, taste or both – but didn’t find any mention in the text. The Arabs would buy pepper,cardamom,ginger and Calico,the fine variety of cotton cloth from Calicut, (Presently named as Kozhikode) in Kerala and sell it to the Europeans at substantial profit. This prompted the Europeans to search for a sea route to India. The most hazardous journey undertaken by the human race was to find a sea route to India and in this process, many parts of the world were discovered. Thalassery or Tellicherry has many other achievements to its credit. Cricket was played for the first time in India in Tellicherry. The first English medium school in Kerala was set up in Tellichery, that school later on grew as the current, Government Brennan College. The teak wood for building Naval Dockyard at Mumbai came from Tellicherry and those sluice gates nearly 300 years old are still in use. Late Admiral Pereira, the most popular Naval Chief till date, and the harbinger of Ration in Kind (RIK) for officers in 1983. It is also the nearest town & railway station to the village of Peravoor, where I hail from. Also the main use of Pepper in the days of yore was not to add spice to food, that came much later as a collateral benefit. Wrapping in Pepper was the primary way of preserving meat before the arrival of refrigeration Ships proceeding on Voyages had to carry meat and to extend its longevity without decay it was preserved in pepper ( that’s why it was found in the nostrils of Ramesses II’s mummy). Since it was as essential for sailing as water or Biscuit ( the variation of bread for sailing use) it was very much in demand and in short supply in those nations who were ardent sailors, and hence it earned the name ‘ Black Gold’.